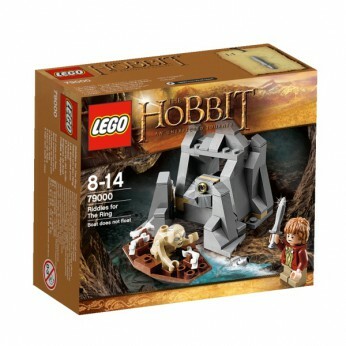 Trick Gollum and help Bilbo Baggins escape with the Ring in this LEGO The Hobbit Riddles for the Ring buildable playset! Use the reveal function to take the golden Ring, but beware – only Gollum knows the way out. Can you escape from the Misty Mountains before Gollum realises the ring is gone? LEGO model number: 79000: Features a rock with opening front section and secret compartment for the ring. The boat has bone elements included; Includes 2 LEGO minifigures: Gollum and Bilbo Baggins, in journey outfit with Sting. For ages 8 years and over; EAN: 5702014960954. WARNING(S): Not suitable for children under 3 years old. To be used under the direct supervision of an adult. This toy costs approximately £11.99 (for the latest and best prices make sure you check our retailer list for the LEGO Hobbit Riddles For The Ring 79000 above). In our review of LEGO Hobbit Riddles For The Ring 79000 we classed it as being suitable for ages 6 years, 7 years, 8 years but recommend you check the manufacturer specific advice before purchasing.